GEORGE DAWSON. I tear up just thinking about him. George represented the best of what America has to offer. His life was a triumph of the human spirit proving that it is never, ever too late to follow your dreams. George lived through the tumultuous 20th century with all of its travails and triumphs: two World Wars, the Jim Crow South, the Civil Rights movement, Vietnam, the technology boom and yes, even the success of Oprah. Thinking about all that George witnessed in his life leaves me breathless. As a direct descendant of slaves, George never learned to read or write, but George lived a very full life of extensive travel as a young man before settling down to marry and raise seven children. After nine decades, 90 years y’all, George decided it was time to fulfill a lifelong dream, so he learned to read at the age of 98 and studied for his GED at 103! Life Is So Good is the little paperback that could and has been passed around between me and my girlfriends for years, but it was not until I heard Life being discussed in the beauty salon that I thought about telling y’all about it. Pitiful, I know. Something that moves me so and I hadn’t thought to share it with you. 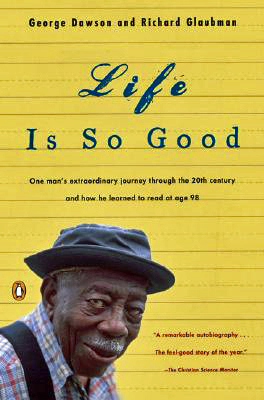 If you want to be inspired or seek hope or motivation, then I encourage you to pick up a copy of Life Is So Good today. It will change your life, I promise! “Things will be all right. People need to hear that. • Books, Life + Style • Comments Off on What’s Your Dream?